In a word, no. Michigan Vehicle Code 257.612 states in part, "vehicular traffic facing the signal shall stop before entering the nearest crosswalk at the intersection or at a limit line when marked, but if the stop cannot be made in safety, a vehicle may be driven cautiously through the intersection." That is to say, unless it is dangerous to pedestrians or oncoming traffic to stop, you must brake when the light turns yellow. The only exception to this rule is when you are preparing to make a left turn and you have already pulled into the intersection. You can (should) complete your left turn after oncoming traffic has stopped, even if the light turns red. 2. It’s OK to transport a previously opened bottle of wine or liquor in the interior of your vehicle as longed as it is capped/closed. Once again, no. In most instances, transporting open alcoholic beverages in a vehicle is not permitted. Michigan Vehicle Code 257.624a states that "a person who is an operator or occupant shall not transport or possess alcoholic liquor in a container that is open or uncapped or upon which the seal is broken within the passenger compartment of a vehicle upon a highway.” That means that if the seal of the liquor bottle has been broken or the wine bottle has been uncorked, even if it is in a bag in the back seat, it is illegal to carry in your vehicle. Believe it or not, it took a decision by the Michigan Court of Appeals to determine whether signaling was required under these circumstance. The Court of Appeals has clarified the language in Motor Vehicle Code 257.648, requiring the use of a signal when changing lanes or "turning from a direct line." The decision states in summary "...a reasonable person of ordinary intelligence is not required to speculate about the phrase's meaning, and the code provides fair notice of what conduct is proscribed. 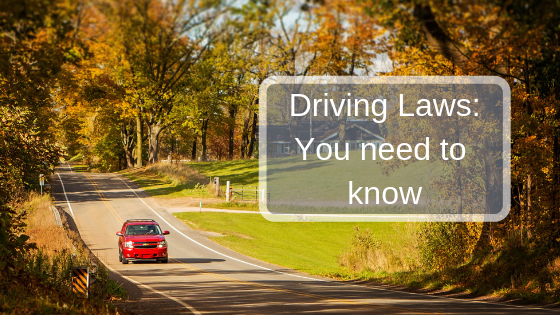 We hold that Motor Vehicle Code 257.648 requires drivers to use a turn signal when changing lanes on a highway and is not unconstitutionally vague.” That is to say, you are required to utilize your turn signal when changing lanes on a multi-lane highway. It depends. If you are over the age of 18, it is technically allowed by law (though not recommended). However, it is unlawful for any person under the age of 18 to ride in the open bed of a pickup at a speed greater than 15 miles per hour on a public roadway, per Motor Vehicle Code 257.682b. Actually, the Vehicle Code provides an exception within a no-passing zone to pass a bicycle traveling in the same direction. The driver needs only allow for three feet between his or her vehicle and the cyclist when passing, according to Motor Vehicle Code 257.636. 6. Are Studded Tires Legal In Michigan? How About Tire Chains? In practical terms, studded tires are not legal for use on the road of Michigan. It’s not that they’re not allowed. Vehicle Code 257.710 allows for the use of studded tires if they meet the specifications determined by the state. The rule makes separate provision for the extreme winter snow and ice conditions of the Upper Peninsula and the Northern Lower Peninsula. The problem is that no manufacturer of tire studs has presented studs that meet the state’s requirement. In regards to chains, Michigan Vehicle Code 257.710 states that a person may "use a tire chain of reasonable proportion upon a vehicle when required for safety because of snow, ice, or other condition tending to cause a vehicle to skid." Michigan Vehicle Code 257.628 sets the statewide maximum speed limit on all unposted highways at 55 mph. Surprisingly, gravel roads are included in this.